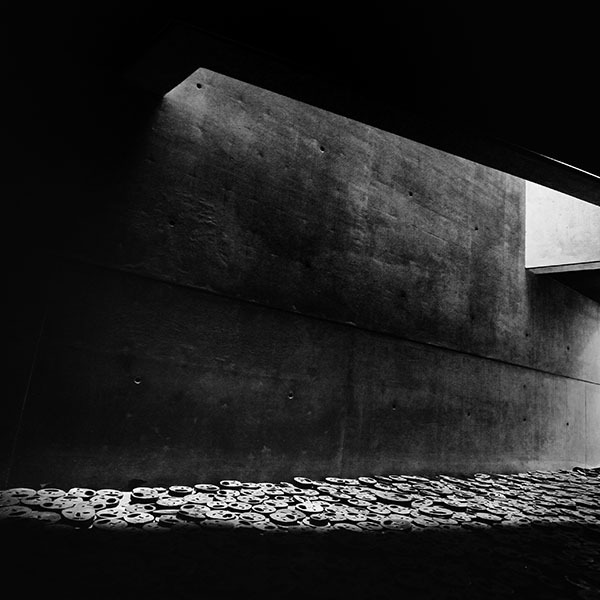 One of a series of photos of architect Daniel Libeskind's Jewish Museum in Berlin. Menashe Kadishman's Shalechet art installation - over 10,000 steel faces cover the floor of the top-lit concrete void like "fallen leaves". The faces gradually disappear from view into the darkness of the far corners of the 20m high bare concrete void. The open-mouthed faces are roughly cut from thick circular steel plates and they clang and echo heavily when they move as visitors walk across them.